This non-fictional work revolves around the theme of scientists reporting facts and being persecuted for it by religious authorities, other scientists, activists, and organizations who feel threatened by the truth or who have a vested interest in the perpetuation of non-truth. The book starts off with Galileo and his cohorts, such as Versalius, Copernicus, and Bruno (burned at the stake for heresy) who challenged the dogma of the Catholic church with ideas born of keen observation and logical reasoning thus making new discoveries and ushering in the beginning of the scientific revolution. Galileo’s middle finger, which he once pointed up at the heavens, is now mummified and on display in the Uffizi museum in Florence, Italy. 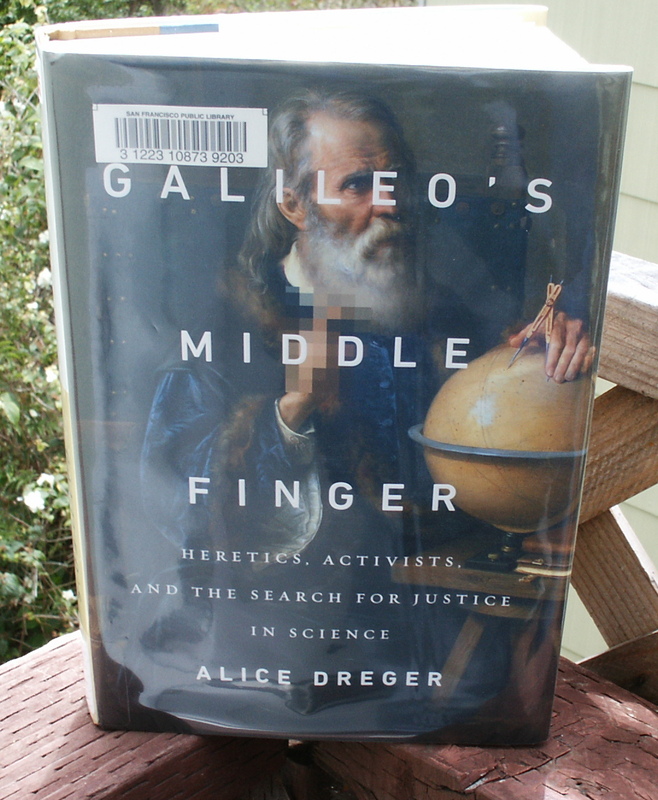 Flashing forward to modern times, Alice Dreger picks up the narrative with several examples of contemporary push-back against scientific facts which ruined careers of researchers, obfuscated the truth, and in some cases, perpetuated harmful medical practices. Each of the these instances is told in thorough detail beginning with the author’s involvement in reporting on the medical establishment’s surgical modification of babies who are born with sexually ambiguous anatomies. This long- standing practice to make intersex babies conform to traditional male or female anatomies frequently bears a psychological cost to the patient and is often done without their parents’ consent or knowledge. The author and her colleagues had considerable opposition to their research. The next story is related and concerns research and theories by a psychologist, Michael Bailey about transexuals. His book, “The Man Who Would Be Queen: The Science of Gender-Bending and Transexualism” painted a more complicated picture of the topic than the transgender activists felt would be helpful to them in their pursuit of acceptance in society. As a result, Bailey became a target of the activists and a campaign was mounted to slander him and his family and put him out of business. Ironically, Bailey was an advocate for transgender people and his research was scientifically valid. Another story involves anthropologist, Nap Changnon, who lived with and studied the Yanomano tribe in Venezuela. Due to his coarse personality and some politically unpopular, albeit factual findings his study revealed about the Yanomano, he became a target for criticism and defamation. Another anthropologist wrote a takedown book about him which was later proved to be all fabrication. The American Anthropological Association failed to clear up the issue due to politics and Bailey was ruined. The last story involves a pediatric endocrinologist who became entrenched in a harmful and scientifically unfounded practise of giving pregnant women who are genetic carriers of an intersex condition called CAH (congenital adrenal hyperplasia) the synthetic steroid, dexamethasone. In spite of no proven benefits and considerable risks to the patients this doctor is unfortunately continuing this practice while misleading the mothers and others as to the risks. The doctor, Maria New, has managed to outmaneuver her critics who are trying to bring the facts out, and she continues to get grant money from the NIH to administer this disproven, deleterious drug therapy. Alice Dreger is a professor of clinical medical humanities and bioethics at Northwestern University’s Feinberg School of Medicine and has written a previous book on the related topic of hermaphrodites. Her book left me with several ideas to keep in mind, such as: truth tellers and whistleblowers in science are not necessarily going to win with valid facts if they challenge the interests of politically dominant people and organizations. Another being, as Steven Pinker, a psychologist at Harvard, puts it; “in activism as in war, truth is the first casualty”. For this reason, narratives of movements, organizations, or individuals, even from causes that we feel aligned to, need to be examined on a point-by-point basis for accuracy, and that no amount of credentials or prestige makes institutions and individuals invulnerable to intellectual corruption.